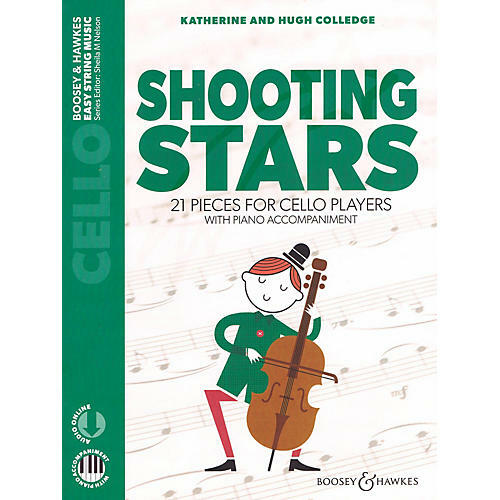 The Boosey & Hawkes Easy String Music series by Katherine & Hugh Colledge contains four volumes of repertoire for new and developingstring players. Popular with teachers and students alike, each title steadily introduces and consolidates new techniques, fingerings, notes and rhythms to build firm foundations for future learning. Each title is available in two editions - one with a CD of demonstration and accompaniment audio tracks, and another with a piano accompaniment booklet plus access to downloadable audio resources. The 21 pieces in Shooting Stars use 2nd, 3rd and 4th finger notes. The collection, which is the fourth volume of the series, also offers rhythmic challenges (triplets, basic syncopation, a piece in five time), a little chromaticism and some new bowings.